As CEO of General Electric for the past 20 years, Jack Welch has built its market cap by more than $450 billion and established himself as the most admired business leader in the world. His championing of initiatives like Six Sigma quality, globalization, and e-business have helped define the modern corporation. At the same time, he is a gutsy boss who has forged a unique philosophy and an operating system that relies on a "boundary-less" sharing of ideas, an intense focus on people, and an informal, give-and-take style that makes bureaucracy the enemy. 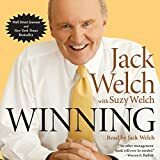 In anecdotal detail and with self-effacing humor, Jack Welch gives us the people who shaped his life (most notably his Irish mother) and the big hits and the big misses that characterized his career. Starting at GE in 1960 as an engineer earning $10,500, Jack learned the need for "getting out of the pile" when his first raise was the same as everyone else's. He stayed out of the corporate bureaucracy while running a $2 billion collection of GE businesses - in a sweater and blue jeans - out of a Hilton in Pittsfield, Massachusetts. After avoiding GE's Fairfield, Connecticut headquarters for years, Jack was eventually summoned by then-Chairman Reg Jones, who was planning his succession. There ensued one of the most painful parts of his career - Jack's dark-horse struggle, filled with political tension, to make it to the CEO's chair. A hug from Reg confirmed Jack was the new boss - and started the GE transformation. The riveting story of his last year - the elaborate process of selecting a successor and the attempt to buy Honeywell - is also told in compelling detail. This is classic Jack Welch: down to earth, powerful, and filled with common sense.